June 3, 2011 - Coast Guard 2128, an Air Station Miami HU-25 Falcon jet, departs Air Station Miami, on Wednesday. The HU-25 Falcon jet departed for its final mission from Air Station Miami and is being replaced by the HC-144 Ocean Sentry. Coast Guard personnel celebrated the HU-25 Falcon jet's 29 years of service as two departed on its final Coast Guard mission to Cape Cod, Mass., and Elizabeth City, N.C., from Air Station Miami, Wednesday. 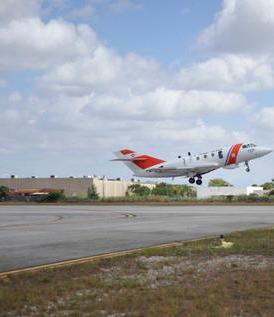 During its 29-year tenure, Air Station Miami HU-25 Falcon jets accrued more than 150,000 flight hours, prosecuted 4,000 search and rescue cases, 5,000 law enforcement cases, which resulted in 3,000 lives saved or assisted, the interdiction of 20,000 undocumented migrants and the seizure of 30,000 pounds of illegal drugs. The EADS CASA HC-144 Ocean Sentry is a medium ranged, twin-engine aircraft used by the United States Coast Guard in the search-and-rescue and maritime patrol missions. Also known as the Medium Range Surveillance Aircraft, the HC-144 is manufactured by EADS CASA (now Airbus Military), and is based on the company's CN-235 transport. Intended to replace the Dassault HU-25 Guardian jet, the HC-144A Ocean Sentry is part of the Coast Guard's Integrated Deepwater System Program of recapitalization and new-asset acquisition. Based on the CN-235-300 MP Persuader, the maritime patrol version of the CN-235 military transport, the HC-144 offers a longer endurance than the HU-25 it is replacing in U.S. Coast Guard service, as well as better performance in the low-level observation role. The HC-144A utilizes the Mission System Pallet concept for its electronic systems. This comprises a roll-on, roll-off electronics suite, manufactured by Lockheed Martin, that connects to the aircraft's systems upon installation. The HC-144A's equipment is similar to that installed on the Coast Guard's HC-130 aircraft, reducing maintenance and training costs. Delivery of the first HC-144 aircraft to the U.S. Coast Guard took place in December 2006. Initial Operational Capability (IOC) was achieved in April 2009; eleven Ocean Sentry aircraft are currently operational with the Coast Guard. A total of thirty-six aircraft are anticipated to be acquired by the end of procurement, with twelve Mission System Pallets being swapped between the operational aircraft. The HC-144A has been involved in several missions during its brief career to date, including involvement in the Marquis Cooper search-and-rescue mission, the response to the 2010 Haiti earthquake, environmental missions monitoring the Deepwater Horizon oil spill, and transporting endangered marine animals for rehabilitation. Delta, US Airways To Transfer Flying Rights In NY And Washington, D.C.
United Pilots, ?Inadvertent? Reinstatement of 9/11 Flight Numbers ?Reprehensible?